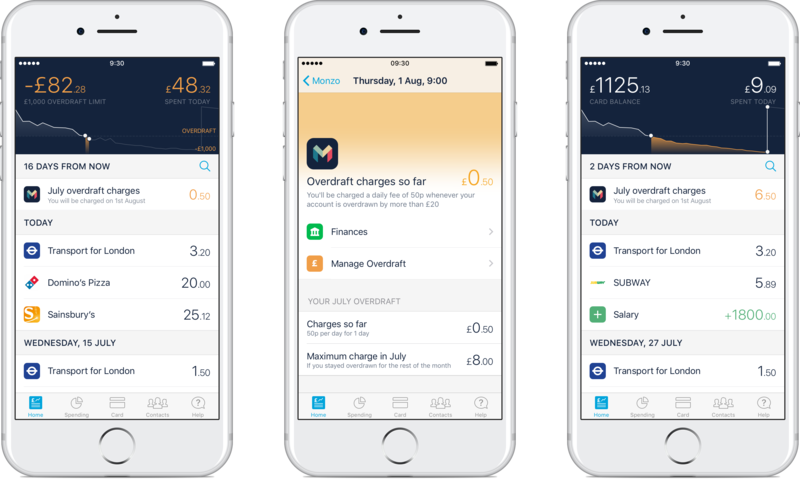 Today we’re excited to offer a preview of the Monzo Overdraft on iOS! With traditional banks, customers often ‘slip’ into their overdraft and only realise this is the case when they receive charges in later monthly statements. The big beasts are taking note. I received updated overdraft terms, which come into effect in Oct I think, from my bank (HBOS), saying they’ll charge 1p per £7 overdraft, and charge and notify me daily. So they’ll be cheaper than you up to £350 in the red, at which point the Monzo flat rate will be better. But the USP about showing interest daily might not stand for much longer. The rest of the Lloyds banking group, and I imagine competitors will probably follow suit. There are a few cases where your account might still go overdrawn without you expecting it — most notably with delayed transactions from organisations like TfL or bills from hotels that come in late that we can’t reject (because they’re presentments — more detail here). Most of the time, these payments should fall within your £20 buffer, but if they don’t, we’ll notify you through the app and give you at least until midnight of that day to clear it. If you don’t clear it, we’ll just treat the it like the normal overdraft and you’ll be charged 50p/day. This will also be reported to credit reference agencies. It’s not clear to me what happens to people who don’t have an overdraft on their Monzo account. Would they also be charged and reported to the credit reference agencies, or is there some other consequence (e.g. card being frozen until debt paid off)? It seems like there is a risk of accidentally having an overdraft added to the account (and reported), especially if travelling with sporadic access to data for notifications and the chance to fix any issues. In the future, it’ll be as easy as tapping the “Overdraft” button on the Card screen, but for now it might take a bit longer so please be patient. Another reason why I think the Card tab should be renamed. This isn’t card specific, it’s about the account. In theory, you could never use the card and still want/use and overdraft. Thanks for the post, great to see long-discussed features coming to fruition! I think the UI looks great, makes it incredibly clear to users that they are in their overdraft and what they will pay for using it. I like the idea of a constant notification as it constantly reminds users of the charges they face for using an overdraft unlike traditional banks who do their best to hide it. I’m not entirely sure about the pricing, perhaps banded daily prices (depending on the level of the debt at any given point) could be an option. It seems odd that someone who owes £100 should pay the same as someone who owes £1,000. I agree on pricing. I’m not a fan of ‘everyone pays the same no matter what’ which has been a reason I’ve left banks previously. I prefer the approach Starling uses, the daily charge changes based on the amount you are overdrawn! I may be wrong (and please someone correct me if I am ), but as far as I can tell, any unplanned overdraft usage would be charged at the same rate as planned overdraft usage, i.e 50p per day for any usage above the £20 buffer. I don’t think Monzo would freeze cards as a form of penalisation, since even legacy banks don’t do that That said, given that banks have an obligation to accurately report the financial status of your account to credit reference agencies, I’d think that any negative balances (be them planned or unplanned) would be reported to the credit reference agencies. In theory, if you went into an unplanned overdraft and sorted things out quickly enough, you’d probably find that this isn’t even presented to the credit reference agencies, and the balance of your account would show as it normally would (in credit or zero) on your credit report; balances like this tend to be reported monthly in my experience. I totally agree on renaming the Card tab, though I think given the added complexities introduced with a current account, something more along the lines of ‘Account’ or even ‘Profile’ would probably be more suitable. I don’t regularly use my overdraft but I think this does penalise people who don’t use it often/not by much. The idea of a flat rate does make it simple to understand / manage though. Perhaps as a compromise either have tiered rates which could get complicated, reduce the flat rate or increase the buffer. First Direct give you the first £250 interest free on their overdraft. Another reason why I think the Card tab should be renamed. This maybe a dumb question, but does having an overdraft affect your credit score? For instance i have an overdraft with Halifax and think i’ve been in it once, however i’ve always been of the impression it’s better to have it and not need it rather than need it and not have it? I’m on Android so it doesn’t apply to my yet, but when it does come to Android i would like to have it activated. Yes it would affect your credit score. I think it can be positive or negative depending on if you are maxing it out or not. Having a lot of unused credit could mean that you might get turned down for further credit. It’s not clear to me what happens to people who don’t have an overdraft on their Monzo account. Would they also be charged and reported to the credit reference agencies, or is there some other consequence (e.g. card being frozen until debt paid off)? This happened to me once early this year, I got an Asda delivery and the charge was shown on Monzo 24 hours before delivery which set my balance to -£6 or something like that (I usually only top up the amount I need when I use the prepaid card). I was surprised I could actually go into a negative balance since there were no overdrafts but I’m guessing they don’t actually take the payment from me since they will do refunds and all that. I simply topped up my card. I’m assuming you wouldn’t be able to use it more if there’s insufficient cash in. Not sure if this was actually meant to happen or if it was a bug, since usually when there’s insufficient cash in it usually gets bounced. The blog mentions any payments that will take you over the £20 or over your agreed limit will be rejected. What payments specifically is this referring to? Debit card,faster payments and bacs make sense but direct debits? I would prefer time to credit the account before these are rejected. While monzo may not charge to reject a DD the receiving company may apply a late fee. Can the cut off for these be midday for example with a notification that morning advising payments are pending rejection if funds are not applied to the account. Not to play devils advocate, but this seems similar to Lloyds Banking Groups new overdraft charges, which is fine, but it became known that their new overdraft charges were equivalent to up to 52% APR. Being an open bank, what is the equivalent up to APR of this 50p flat fee? I could try and calculate it but Lloyds did release this cookie of an APR when asked. I can’t wait to try this out, however, I can’t see myself using it much due to the cost, maybe because I like to shop around and aget a pretty good rate, I bank with Metro Bank who charge 15% AER. If i was to borrow £250 over 30 days they would charge me £2.89 in fees, the same with Monzo would cost me £15! If I was to borrow the same amount over the same time with First Direct, it would cost me nothing! Lloyds are able to give an equivalent percentage rate as the amount you pay goes up as you borrow more. Monzo will charge you the same no matter how much you’re in debt. So if you’re £20.01 overdrawn for a whole year you’ll pay £182.50. If you’re £5000.00 overdrawn for the same year, you’ll still pay £182.50. The equivalent percentage rate would make your eyes water in the first example, but look great value in the second. Edit: Approx 912.5% in the first example. Approx 3.6% in the second example. I think. Haven’t taken into account compounded interest. Thats my thought. In past years, consumer rights organisations have criticised payday loan firms for their eye-watering equivalent APR’s because of fixed fees. Lloyds must have taken this into account and thats why they scaled their approach but it still has a high APR compared to regular credit. I just don’t want Monzo with the headline ‘startup bank in 100’s% APR on £21 overdraft debt’. I truly think a lower fee or higher free overdraft level is needed. As much as I would like to use this and unify all my accounts, it’s just not worth the cost when I can use my Santander Student account for free overdrafts. Even a small £500 free overdraft from Monzo would go a long way.